Many patients interested in cosmetic dentistry have heard about porcelain veneers, but today’s porcelain veneers are a far cry from the original veneers. Read this post to learn more about the history of porcelain veneers. 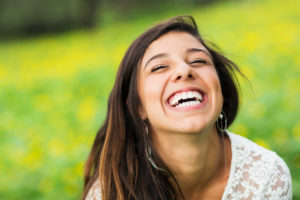 If you’re looking for a fast, easy, minimally invasive treatment option to transform flawed teeth into flawless smiles, porcelain veneers may be right for you, but there are numerous cosmetic solutions available. Schedule a cosmetic dentistry consultation to learn more about your treatment options. The first porcelain veneers were used by Charles Pincus as part of an actor’s costume to change his smile for a film shoot. These veneers were attached using a removable adhesive. Later, people in Hollywood started to use longer lasting acrylic veneers, but they were still easily damaged and would need to be replaced frequently. In 1959, Dr. Michael Buonocore invented etching. This is a process still used regularly as part of numerous dental restorations and cosmetic procedures. In order to create a more porous surface to cement restorations in place, an acid is applied to the tooth surface creating deeper pits and grooves. In 1982, the Simonsen and Calamia research group discovered how they could use the etching technique as part of dental treatments like porcelain veneers. A hydrofluoric acid is painted onto the surfaces of teeth. Then, the putty like bonding resins, used to attach veneers, crowns, and other restorations, are applied to teeth where they seep into those parts of the tooth etched with the acid creating a stronger, longer lasting bond. This is the first semi-permanent dental bonding treatment available. Using this method, most patients retained their veneers for several years before they would need to be repaired, reattached, or replaced. Today, we use the same etchant and bonding techniques, but these application methods are paired with high quality, stain resistant porcelain veneer materials that more closely resemble healthy, natural smiles. Once in place, porcelain veneers can last as long as 30 years before they need to be repaired or replaced. At New Image Dentistry, your San Antonio dentists and team offer a wide range of cosmetic dentistry services to transform the most flawed smiles. Don’t hesitate to call our office to find out more or schedule a cosmetic dentistry consultation. We’ll walk you through all of your cosmetic dentistry options and help you find the right treatment, or group of treatments, to create the smile of dreams. Our personalized cosmetic dentistry plans will fit your needs, budget, and schedule, leaving you with a picture-perfect smile.